Implant supported dentures with Dr. Kiya Green are designed to attach to a set of dental implants and provide a very secure fit. They do not slip or move easily but can be removed for cleaning. Many patients in Matthews, NC enjoy several lifestyle benefits when they opt for implant supported dentures, as these tooth replacement options work just like permanent teeth. Since traditional dentures sit on top of the gums and are secured with adhesives, they run the risk of moving and slipping around. There is no attachment to the jaw bone, so there is also a risk of bone loss. Implant supported dentures offer the benefits of dental implants as well as dentures. These dentures are anchored with dental implants that are fused to the jaw bone, which provides more stability and a secure fit. They function just like real teeth and can be a viable solution for many adults with multiple missing teeth. Bar retained dentures involve placing three or more dental implants into each arch. The implants are connected with metal bars that serve as a base for holding the dentures, which are attached with metal clips. This type of fit eliminates the looseness and discomfort associated with traditional dentures. Also called stud attached dentures, these utilize a ball and socket design. The base of the denture is created with a set of sockets that line up with balls placed on top of the dental implants. These Locators that act like snaps provide a very strong fit and makes it easier for the patient to eat and speak clearly. 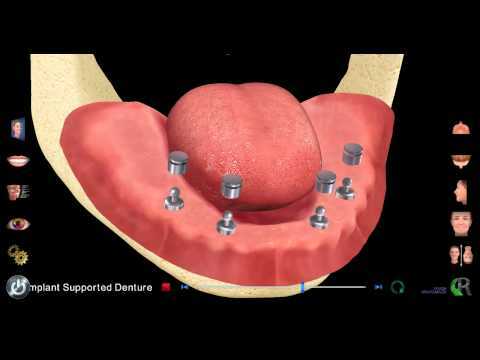 Interested in how implant supported dentures are placed? Check out our video and find out! Implant supported dentures are a healthier alternative to traditional dentures. Learn more about the benefits of implant supported dentures by scheduling your consultation with Dr. Green in Matthews, NC today!